It must be spring. There can no longer any doubt. Over several days now we have spotted two robins around the bird feeder. Robins, especially young males (which will come as no surprise to you) are overly competitive and will, quite literally, protect their patch to the death. This over possessive tendency, which might be though of as nature’s way of ensuring the continuation of the species, in fact leads to an average life expectancy of a mere 1.1 years. Whereas. if they can survive beyond this teenage angst, they’re good for up to twelve years. I thought you might like to know that the robin’s breast is that bright red colour because, in the olden days, he used to spend part of his days carrying water to quench the parched throats of those poor souls who found themselves (and who, I’m sure would add, through no fault of their own) stoking the furnaces in the nether regions of the afterlife. This took our robins too close the eternal fires and scorched their breast feathers. I’m sure you can do all this over the Internet these days. Two robins in the garden means they must be mating. There can be no other reason for their co-existence. What a strange way of life. How can you put all that effort into feeding, caring for, educating and generally allowing your offspring to consume a significant part of your life, without being able to spoil the grandchildren? What interesting information about the robin! I had no idea that their territorial behavior often costs them their lives. And the myth about how they got their red breast is fascinating indeed! Spring seems to be arriving here as well. The groundhogs are emerging from their burrows; the robins are returning; and the bluebirds are squabbling over which mated pair will claim the bluebird house in the woods. Doesn’t all that hustle and bustle make you feel as if we’ve survived! We made it! Winter slouched around, with his hand in his pockets, like a bear with a sore head and we didn’t dare speak out of turn – in case we upset him. Now he’s grumped off we can all breathe again! What a relief! Hope you’re having some sunshine to go with the spring in the air. We had three wonderful days and then back to normal too. One of the weather reporters on the radio this morning, commenting on the fact that we were back to wind and rain, in an effort to keep things positive, assured us, that as it was now spring, the rain would be warmer! 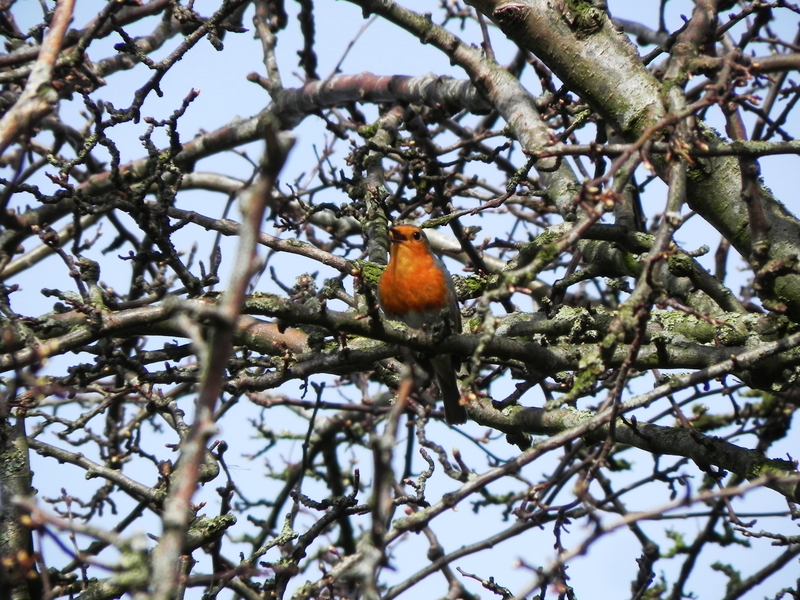 what a great capture Dave, excellent colour of the robin’s breast. I have seen a few bobbing about but not in my dinky garden. It was lovely sunny and clear Ange – and he just sat there as we walked past – he almost glowed!